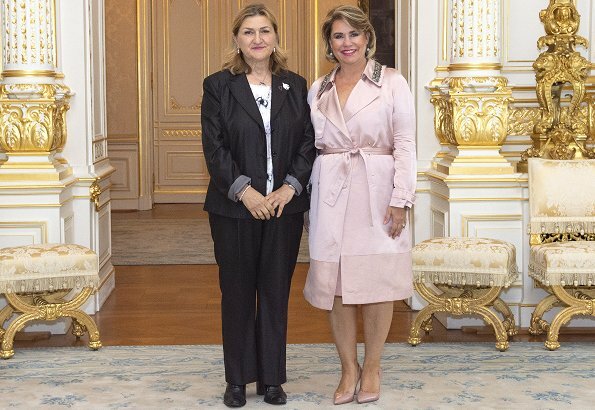 On June 1, 2018, Duchess Maria Teresa of Luxembourg received Jadranka Milicevic who is a Bosnian human rights women activist at the Grand Ducal Palace of Luxembourg. Mrs. Jadranka Milicevic from CURE Foundation in Bosnia and Herzegovina has been selected as one of the 14 human rights defenders from over 1,000 applications worldwide as a European Parliament Sakharov fellow in 2017. She is working in CARE International Balkans on the regional project for active inclusion and the rights of Roma women in BiH, Serbia and Montenegro. This is a beautiful look for the Grand Duchess - lovely pink and a perfect style with soft shoulders. I’m not sure this could be improved, will wait to read further comments. May I say she looks slimmer without seeming to be critical? Agree, she looks beautiful and slimmer. GD Maria Teresas dress looks like a robe,sadly today she missed the target,usualy she is spot on. Is she wearing a coat(?) Inside the royal palace? not a good choice. The color is great on the Grand Duchess but I must say, when I first saw it, I thought it looked like a night robe. Not her best look but I agree she has been looking slimmer lately. I love her hair style and color. I think she looks lovely. I like the soft pink on her - always a flattering colour on people with darker hair and skin tones. She does look slimmer - don't know if she is, but I think by wearing something that gives a bit of definition to her waist (rather than just a square/rectangle cut that she quite often favours) is very favourable . 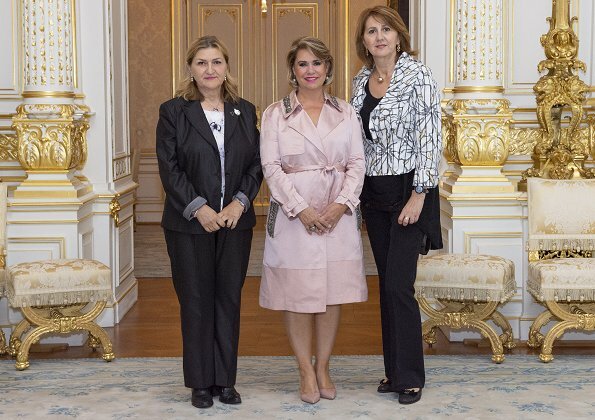 I am very impressed with commitments of Duchess Maria Teresa and Jadranka Milicevic to human rights. I love the colour and the tied waist is very flattering. I didn't think "robe" until I read the other comments. Hmm. I still think she looks good. Now here is a pale pink coat that Queen Letizia could have worn in that military parade instead of the one that looks like a child's coat. It is a beautiful color and style and the collar and sleeve trim helps to define it better. But I still think that Letizia's pale pink for a military-honoring parade was an odd choice (last week). Oops - I meant pocket trim. Maria Theresia always looks stunning. It seems to me too that she has loosing weight. Her smile is beautiful and warm, her eyes sparkling all the time, like her very much!